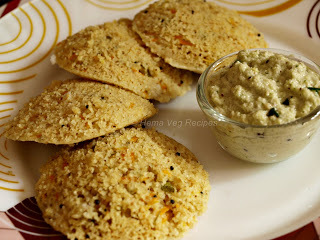 Here is the recipe for Bisi Bele Bath powder. 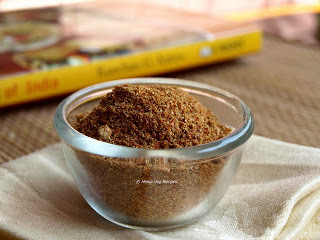 My earlier post describing the Bisi Bele Bath recipe did not make use of this powder and in my experience gives the best taste. You can save some time by having Bisi Bele Bath powder replace some of the ingredients and related steps described there. Heat Oil in a pan, add Bengal Gram/Channa Dal and fry for 2 minutes. Then add Urad Dal / White Lenthils and fry until both Dals turn golden brown in color. Now add all the other ingredients like Coriander Seeds, Cumin Seeds, Fenugreek Seeds, Cinnamon, Kopak Buds, Cardamom, Cloves and Red Chillies and fry for 5 minutes or until the Red chillies change the color. Then remove from the flame and let it cool. 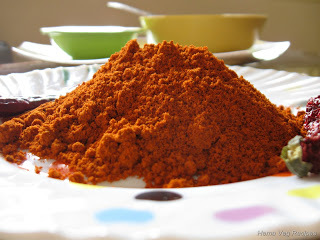 Once all the fried ingredients are cooled, transfer them to a mixer jar and grind them in the mixer grinder until you obtain smooth powder as shown. Bisi Bele Bath Powder is now ready. When preparing Bisi Bele Bath, you can add 2-3 tsp of Bisi Bele Bath Powder (as per your taste) directly to the cooked vegetables. 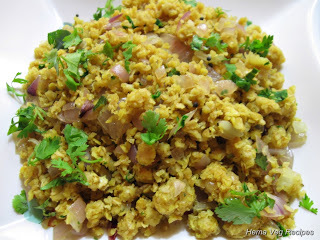 Or if you need Bisi Bele Bath to be a little tastier, then grind 2-3 tsp of Bisi Bele Bath Powder with 1 cup of grated Coconut in a mixer grinder to a smooth paste and then mix it with other ingredients. Hi Sonu, Thanks for the comments. In Kannada we call it as Marathi Moggu. 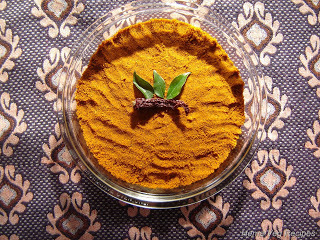 It is known by the name Kopak Bud in English and as you can guess, is just is one of the spices used here. Cannot say whether you can get to see this in Australia; try to ask in Indian stores. I hope this helps. If you still have trouble with this, let me know and I will see if I can find more information (don’t know what they call this in Gujarathi). I really want to try this recipe out. What is a cup measure? is 1 cup = 1 paavu? Please advise. 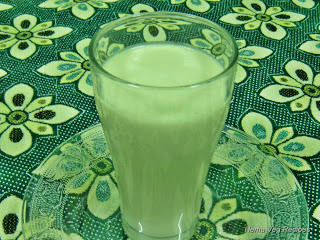 Smitha – 1 cup = 3/4 of a paavu. 1 cup is approximately 250 ml. Shruti – Sorry for the delayed reply. If you cannot find Marathi Moggu, pls feel free to skip it. It is not a must for Bisi Bele Bath and I cannot really think of a good alternative for this since Kopak Buds carry their own unique aroma and taste. Thanks for checking with me. 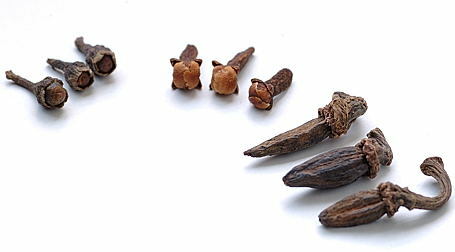 Will Star Anise seeds be a good replacement for Moggu? I think Star Anise seeds will provide a different aroma to the powder than the Marathi Moggu but may be worth trying. BTW, you can skip Moggu altogether if you cannot find them. Hope this helps. 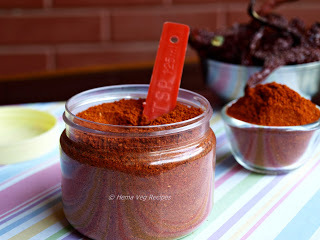 How many of byadagi and guntur red chillies each? 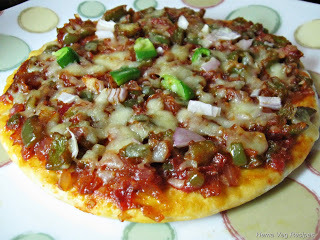 Priya – As I have mentioned, use 15-18 Red Chillies with slight variation depending on the degree of spice desired by you. And when it comes to question of how many of Guntur and Byadgi Chilli to use, the decision is best made by you. 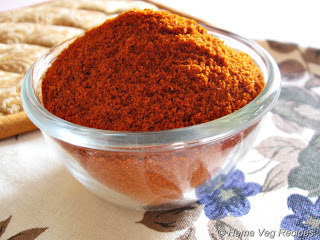 If you need more spice, have a greater percentage of Guntur Chilli. 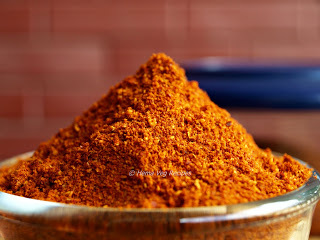 Else, if you want to be on milder side, use Byadgi which I believe will impart reddish color to the Bisi Bele Bath powder and eventually to the dish itself. A good mix of both (say 30% Guntur and 70% Byadgi Chilli) will help. At last found a wonderful sight to prepare BBB powder. 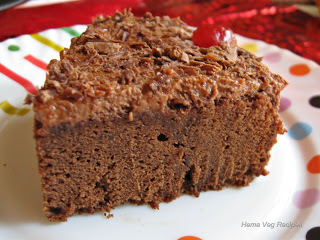 Thanks for your recipe. One small doubt. 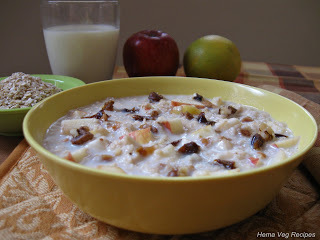 Do we need to take equal ratio of bengal gram and urad dhal? 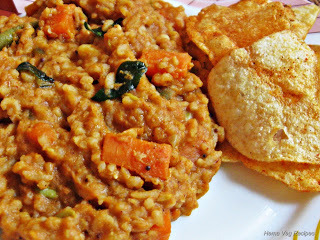 As the ratio of bengal gram and urad dhal differs in frying ingredients in your bisi bele bath recipe. Can you please clarrify it? 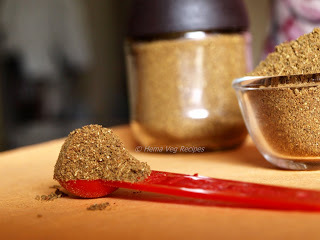 Thought of making this Bisi bele bath powder in bulk. Thanks for the recipe of BisiBeleBath powder. Mine wouldn’t turn out well at all so I am using always MTR BisiBeleBath powder. Will try your way. I tried kadai paneer and its awesome:) Thanks a lot. My son wants varieties of curries like mixed veg curry,aloo mutter,dal and many more and i want to try these curries to obtain the same of hotel taste. Is it possible? Kindly give me the receipe for preparation of the Vangi bath, I tried hard but could not browse in your posts, please mail me the receipe . 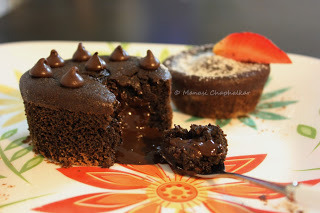 I skipped the Marathi Moggu, and the powder still came out good..Thumba thanks ! Recipe seems delicious. Can you please tell me for how much rice we can use this Bisi Bele Bath powder? It totally depends on your taste Chaitra, I usually add 2 Tbsp of Bisi Bele Bath powder to one cup of Rice. 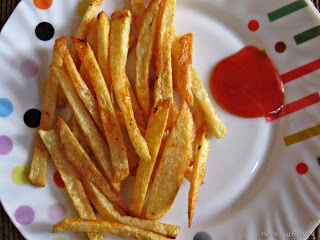 If you like it spicier, you can add 1/2 to 1 tsp extra powder to it. Thank u so much for your reply will try this tommorrow. This is really useful web site for cooking.I am very much beneficial with this.I like it very much.